A HaiLin vadonatúj HL2028 terméke egy Android és iOS okostelefonnal kényelmesen és egyszerűen vezérelhető WiFi-s elektromos padlófűtés termosztát, mely egyedülálló a maga nemében! A modern, teljesen fekete és egy speciális HaiLin Key vezérlőgombbal rendelkező felület vizuális megjelenésével egy teljesen új, magával ragadó és lenyűgöző, üdítő színfoltot jelent a termosztátok hagyományos palettáján! A HL2008 sorozat tagjai egy független, mikroprocesszor alapú vezérlővel és LCD kijelzővel rendelkező speciális termosztátok, légkondicionálók, bojlerek, keringető szivattyúk, szelepek, vagy éppen elektromos fűtőberendezések kapcsolására/vezérlésére tervezve. Széles modellválasztékkal a 2, illetve 4 csöves légkondicionálók, fűtő és szellőztető berendezésekhez. The imnovatrion of "Breath" is to concern more on product design and application emotion, it more tocus on producr life, interface between user and thermostat, intelligent control, operation and brand new visual experience to realize "comfortable life is so simple". "Breath" pays more attention on people's feeling. It completely gets rid of the cold, isolated propertues trom industrial products, and its fresh life characteristics brings more kind, real interactive experience to people. "Green" is more concerned about people's feelings, completely out of the industrial cold, isolated feature, which features live the life of the body and people have a more intimate and true interactive experience. Waiting. "Breath" arise from your exactly being, it integrates the latest infrared sensing teclmology, which can automatically detect approach of the human body and active the themmostat as your arival. Because of your presence "green movement" into the latest infrared sensor technology to automatically detect the body close, with your arrival automatically. "Breath" breathing button flashing will not disturb you, but always remind you to make energy saving by yourself. As you breathe and the "Green", the quietly waiting reflecting the atmosphere does not bother you, but I remind you, to let you know that "voluntary action energy" on the side. "Breath" become living along with your touching, it adopts the latest capacitance touch pad technology, easy to operate. Your touch and by the "green movement", using the latest technology capacitive touch buttons, release your finger to maximize free space, easy functions. Easy. Always believe simple is the beginning of emotion. "Simple" is exactdy to be the core value of "Breath". 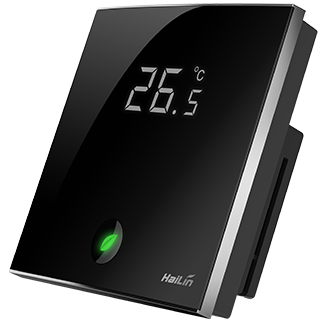 You may easily manage the indoor temperature completely through one-key touch, realize the energy saving and comforrable. Because of your simple "green movement", this is the beginning of all emotion, you can easily through a button touch adjust the indoor temperature to achieve comfort and energy saving. Black shows dignity, elegant and mystery, which reveals the natural feature. The early life of black, noble, elegant and mysterious, highlighting the natural qualities. Germ of life, with pure, fresh natural energy. Budding life, with a fresh and clean energy.